The festive season has ended and the pre- and post-Christmas sales are over. While many bricks and mortar stores are still offering “discounts”, are they really saving you money? Or have they bumped up their full prices so it just seems like you are getting a bargain? There is no doubt that the retail industry exists to make money – and lots of it. It’s worth using a little know-how to play the same game and, hopefully, beat the big players at their own game! How do you survive the post-Christmas sales blues, and make your hard earned money go further? Choose your moment – if you don’t need it right now, wait. That dress you love, which currently costs $250, will be on sale in a mere couple of months. There’s a risk that it may no longer be available, but patience can win out and if you aren’t willing to pay top dollar, you might just get lucky as long as you watch carefully for sales – some are day-only, so be astute. Haggle – don’t be embarrassed to ask if the displayed price is the best they can do. You’d be surprised how often there are “VIP” type discounts of up to 10% or more for certain goods – all you need to do is ask. If the answer is “no”, be prepared to walk away – sometimes the vendor is unable to comply with your request, but often they can. This writer actually worked for a “high end” fashion label – and to close a sale, we were instructed to be creative and could, at times, offer up to 30% discount. It’s worth asking. Shop online – not only is it convenient, you have a myriad of stores at your fingertips. You can easily do your research – find the products you really love, compare prices (but don’t forget to account for shipping costs and currency exchange rates), and explore stores and products you might not have easy access to in your local area. You will also save by not paying for fuel or parking fees! As long as you purchase from reputable dealers and pay via secure server, with some care, internet shopping is the way to go – and the way of the future. Loyalty programs – there are hundreds of loyalty programs from which to benefit. While most are limited to the store from which you make that purchase, not all are the same. For example; Oz web Rewards is a unique rewards portal in the Australian online shopping forum. With over seventy five participating merchant members, representing Australian small and medium online businesses, customer members can join for free and shop with any of these stores. Rewards are earned at a generous level over all stores and can be pooled to spend anywhere in the Oz web Rewards store – which showcases products from every merchant listed. Additionally, this company gives back on the customer’s behalf, donating to any participating charity or organisation at no cost to the customer. Everyone wins. So with a little creativity and forethought, it’s not difficult to come out on top when you go shopping – even if the Christmas sales are over for another year. Here at Oz web Rewards, we are proud and excited to announce our brand new Sponsorship Program: a great way to passively raise funds for the organisation of your choice while purchasing great products from Australian merchants and being personally rewarded at the same time. Donor fatigue is one of the biggest problems facing organisations looking to fund raise; with the Oz web Rewards Sponsorship Program, any organisation may mobilize their members to earn donations for them by simply joining Oz web Rewards (free to sign up) and then shopping for themselves online via our rewards portal. Active members will be not only shopping for what they want, when they want it; they will also be generating generous rewards for themselves while at the same time earning donations with every purchase for their nominated charity, sporting team, local school or community group. Any Australian-based charity or community group is eligible to join this exciting new program: sporting teams, charity organisations, community groups, social clubs, school P&C associations, etc. Once signed up to the program (free), all the organisation needs to do is promote the program to their member base. When a new customer member joins, they can nominate their chosen sponsorship organisation from the list and any purchase made via our portal and our 75+ merchant members that is eligible for customer rewards will also earn automatic donations for the organisation: nothing to sell to family or workmates, no volunteers required. Sponsorship rewards are separate from customer rewards; so customers may rest assured that whether they nominate a sponsorship organisation or not, their own personal reward level will be the same generous 5% of the value of their purchases. The Oz web Rewards Sponsorship Program launched just this week; we already have a fabulous charity organisation signed up and waiting for customer sponsors: The Orangutan Project. Check out Oz web Rewards and our Sponsorship Program today! Coca Cola – The “Healthy” Option! 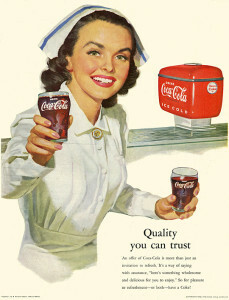 So said this vintage advertisement for Coca-Cola from circa 1950. And to prove the point, who better to espouse the health benefits of this refreshment than the image of a nurse – wholesome in and of herself? Coca-Cola has a long and illustrious history: first formulated in the 1800′s as an alcoholic beverage known as Pemberton’s French Wine Coca, prohibition in 1886 resulted in the non-alcoholic version of Coca-Cola being developed. It was initially sold in a pharmacy as a patent medicine; it was claimed to cure headache, morphine addiction, digestive reflux, nerve pain and impotence. By the time the drink celebrated its fiftieth anniversary in 1935, it had been certified as a “kosher” product. Today it is one of, if not the, world’s most highly selling soft drinks. But is it healthy? Today we would respond to that question with a resounding “no”! Containing carbonated water (the only healthy constituent), sugar, caffeine, caramel colouring, flavourings and phosphoric acid, there can be no illusion of any real health benefit - though it can honestly provide some energy boost (all that sugar!) and for some, can in fact be helpful for headache sufferers (thanks to the caffeine content). Oz web Rewards might not have merchants selling coca-cola, but we do have discount shopping offerings on a range of gourmet food items, including one dedicated to American food novelties. Check it out at www.ozwebrewards.com.au under the Food and Alcohol Category. How many of our readers grew up with Lego? This popular construction toy, with blocks for building all kinds of magnificent things, originated in Denmark in 1932. 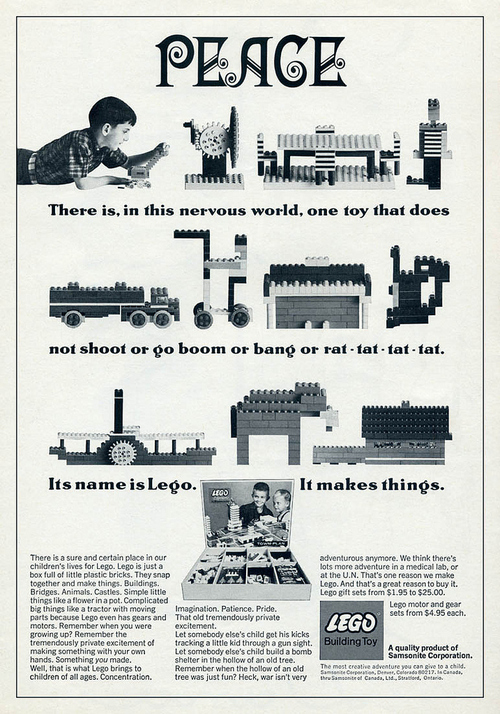 Previously made from wooden blocks, Lego started producing plastic toys in 1947 and in 1949 the first interlocking blocks we’re all now familiar with were produced for the first time. It’s reassuring to know that some things really do never change. With all the technological gizmos and computer-based games today’s kids have, children still have good, old-fashioned fun with some of the simpler things which their parents, and even their grandparents, enjoyed in their own childhood days. It’s also amusing that parenthood hasn’t, in many ways, changed either. The 1950s and before are often presented as halcyon days where all was perfect – perfect working husbands came home after a hard day to perfect wives; perfect children already bathed and fed and ready for bed. This print commercial suggests otherwise! Any parent can relate to a desire for their children to play quietly for hours with quiet toys and games. Mothers were obviously a bit frazzled! 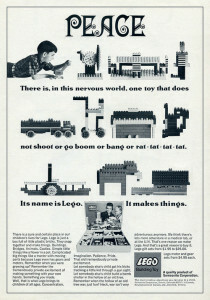 Lego had this benefit as well as others: children using their imaginations and creativity for good – not playing war games, which at the time were popular with little boys but tiresome for their parents in a recent post-war world. At Oz web Rewards we have a very large number of online stores who sell toys of all kinds and also offer rewards in our generous loyalty program. We are your one-stop portal for online shopping Australia-wide, and we guarantee that if you browse our games merchants, you will find myriad toys to suit your needs – old fashioned, educational, and very modern toys are all available here. It’s free to join – and you get 5% in rewards points every time you shop via our website. Check it out today – you can even do your Christmas shopping from the comfort of your computer!